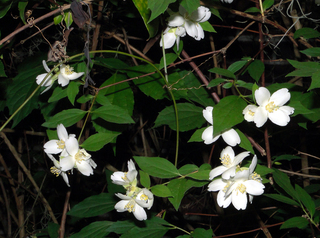 Philadelphus inodorus.© Copyright Bobby Hattaway 2011.discoverlife.org (Accessed 5/2014). Philadelphus inodorus is a shrub to 3 m tall, colonial from root sprouts, older bark grooved, shreddy, pale, brown, branching opposite, stems arching, rather weak, brittle, young twigs brown, leaf scars horse-shoe shaped, with winter bud in center, vein scars three. Leaves opposite to 7 x 3.5 cm, margin toothed to entire, egg-shaped to oblong. Flowers white, odorless, stamens yellow, numerous, 4-5 cm wide, regular, petals 4, calyx lobes 4, from an enlarged base (hypanthium), 1-4 flowers per cluster. Fruit dry, a 4-parted capsule with numerous tiny seeds (Rehder 1990). Origin: Mountains of PA south to Al. Habitat: Escaped from cultivation. Less frequent than P. coronarius.